Dancers whirl through dark space, crossing paths, each following their own axes as they run at full speed along pre-drawn lines like ebullient planets. A deconstruction of the relationship between dance and music, Vortex Temporum is an engaging work, both powerfully engaging and lightly playful. 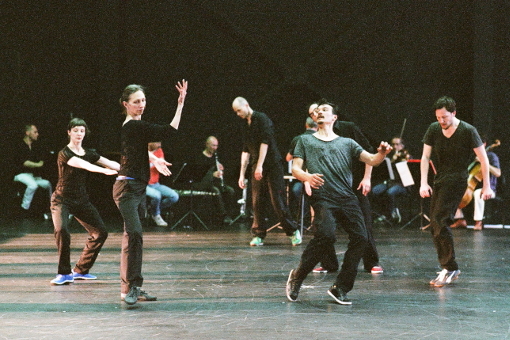 This week saw the UK première of this 2013 choreography by Anne Teresa de Keersmaeker at Sadler’s Wells to the strange and eerie sounds of Gerard Grisey’s 1996 piece by the same name, performed by Belgian dance company Rosas and contemporary music ensemble Ictus.